Born on July 27, 1957 in Baku, Azerbaijan. In 1979, graduated from Leningrad/St Petersburg State University. Dr. Ioannesyan holds a PhD in Iranian linguistics and literature, a senior researcher at the Department of Middle Eastern Studies, the Institute of Oriental Manuscripts of the Russian Academy of Sciences. 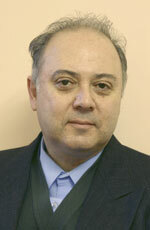 Dr. Ioannesyan has taught Afghan-Persian (Dari) and Persian (Farsi) languages, as well as Persian culture, history, and religions at St Petersburg State University and the University of Virginia. He has a number of publications on the Herati dialect and Persian dialectology in Russian, English, and Persian, including a monograph, The Herati Dialect of the Dari Language of Modern Afghanistan. Major research interests: Islam (Sufi Islam and Shaikhism), Babism and Baha'ism; languages and dialects spoken in Iran and Afghanistan (Dari). Ioannesyan Y.A. [Review:] Zare Yusupova. The Kurdish Dialect Gorani. A Grammatical Description. Saarbrücken: Lambert Academic Publishing, 2017 // Written Monuments of the Orient. 2(6), 2017. P. 119–121.